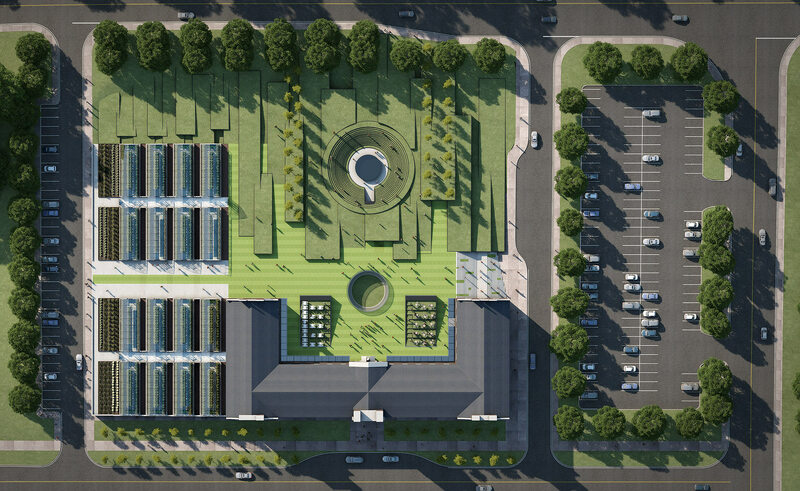 For a commission for the restoration and redevelopment of The Boyce Thompson Institute for Plant Research from 1924 and its six-acre site, the design preserved and readapted the entire property’s landscape, main building and greenhouses with hospitality, commercial and cultural programming spaces; a food-to-table urban farming and education facility; and community engagement in public green spaces. The new design incorporates the readaptation of the 70,000 square foot main building and grounds into a boutique hotel; corporate retreat and conference center; exhibition, performance and event spaces; indoor and outdoor restaurant, bar and café; retail spaces and an outdoor amphitheater. The new outdoor amphitheater and reflecting pool—a public gathering place as well as event/performance space—is inspired by the Shiva Lingam, an abstract representation of the Hindu deities Shiva and Shakti, symbolizing oneness and the dynamic forces moving through the universe. The addition of a light wells on the grounds and an underground passageway from the outdoor amphitheater create light and access for the converted ground-floor event and commercial spaces in the main building. The restoration of the sixteen original greenhouse to agricultural productivity incorporates urban farming education facilities for adults and children, reestablishing one of the original missions of The Boyce Thompson Institute for Plant Research.